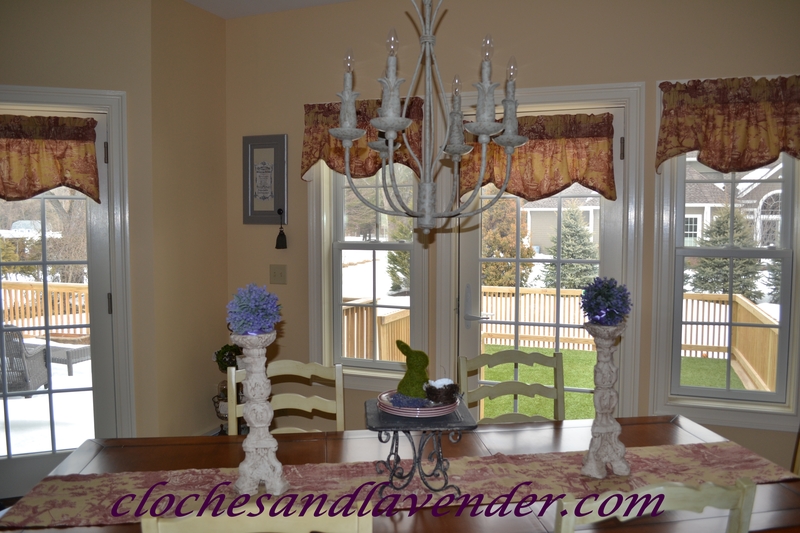 Today I am sharing our spring kitchen table with you. I’m thrilled with the candle holders. Much softer to go with the décor, I wouldn’t have been happy with those black bottoms at all, take a look. The lavender balls I couldn’t pass up at Michael’s when I saw them, they were a must. 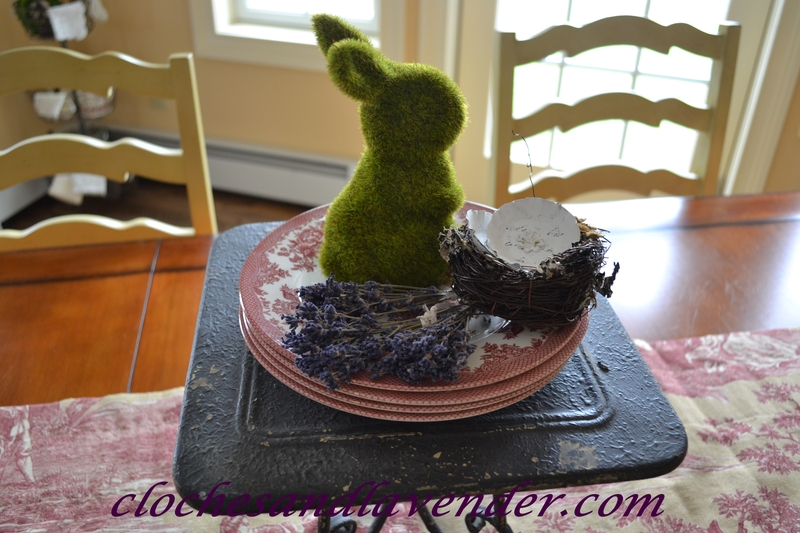 The moss bunny I had and purchased from Save-on-Crafts and the metal pedestal is from Antique Farmhouse. I purchased them over the winter. I added some transferware plates that are from Home Goods I spied years ago. I added a small birds nest filled with vintage tins I purchased from Rosemary, Villabarnes, a special order, love her. The last thing I added was small dried lavender bouquets I had on hand for an extra touch. Working on some more spring decorating and ready to share soon. This weather really gets me in the mood, let’s hope it lasts!!! It looks like a beautiful day your way, Cindy! We went through that melting snow “flow” and I’m just glad it is almost gone. We also have about 60 today with sunny skies. This afternoon is the first day I got to open the screen on the front door to let some fresh air in. I can’t wait until it is just a bit warmer to open all the windows, too! Yeahhhhh! Me too Cyn! Doing some cleaning and maybe a spring table too real soon. Yeah for that lovely weather. We are having the same here in Chicago land. Lovin it. Hope this means we have turned the corner on winter. Have a great week. This looks so pretty and fresh and sweet, Cindy! Yay spring!! I know it won’t last but it won’t get bitter cold anymore. Very pretty Cindy!! Love those lavender balls. I wouldn’t have walked by those either. Love your table display Cindy, Gorgeous outdoor views too. Glad your snow is melted!! Welcome springtime!! Thanks Celeste. The area you saw was our puppy run. Their area is the only snow free zone right now. Your table looks so lovely. Hope spring comes soon for everyone up north. Thanks Beverly, no spring yet. I’m so happy to have that snow melting, finally! Your table looks nice and springy! 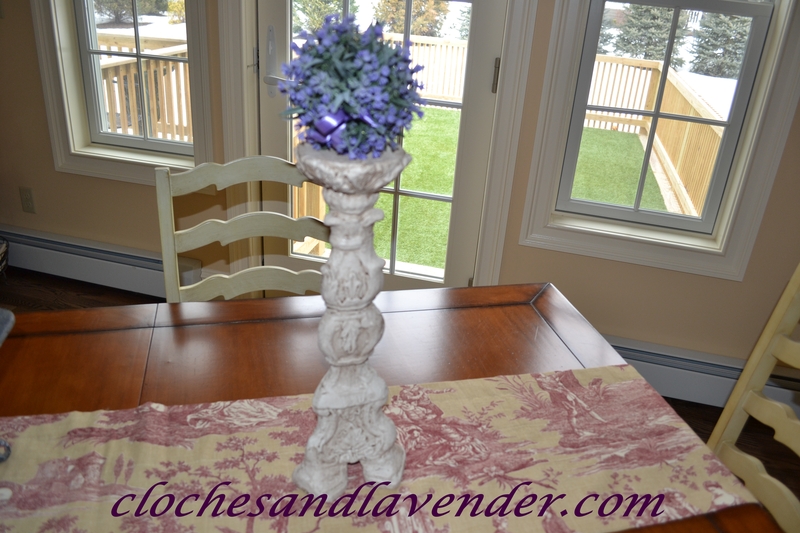 Love your table vignette….the lavender balls are very pretty! Fingers crossed the spring weather is here to stay! Thanks so Des. I think we are done with the bitter cold. Cindy, Your Spring table is so pretty! I love the painted candlesticks! The lavender balls are a perfect addition to them. The bunny is adorable and I love Rosemary’s nest! Your kitchen is lovely- such a soft palette! The weather has been pretty and warm here too, but today it’s cold again. Have a wonderful weekend! Must be a lavender kind of day! We just got in a shipment of our culinary lavender ~ ohhhhhh the smell is heavenly! It’s going to be 60 here tomorrow, so even I’m inspired to bring out some spring decor! 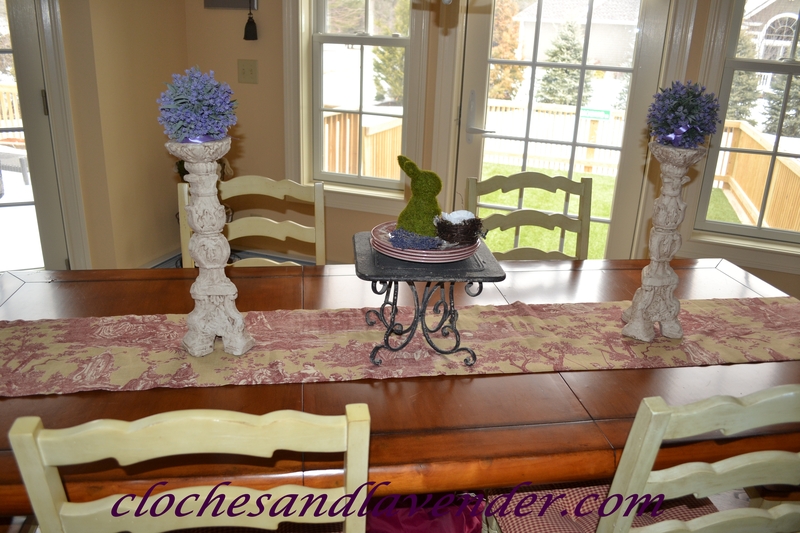 You table looks lovely with your pretty toile runner and that cute moss bunny! That is such a charming centerpiece for the table. I love the little lavender balls on those candlesticks. That definitely says Spring to me! Glad to hear that the snow is finally melting and the weather has warmed up. We had beautiful warm weather today too. In fact, I’ve had to turn on our A/C in the house already! LOL peope peeing in your yard! Love your spring Easter table….perfect! It really sounded like that. There was so much ice and it was melting quickly. I love the color purple and lavender for Spring. Your table looks very warm and inviting Cindy! Thanks for sharing with SYC.